View this project on my website! The Wii nunchuck is an attachment for the Nintendo Wii controller. It combines a two-axis joystick, a three-axis accelerometer, and two buttons into one package. Tod Kurt previously created a library for the nunchuck intended for use with his product, the WiiChuck Adapter. Since this product has been discontinued at SparkFun, I will show you how to use a Wii nunchuck with Arduino without the use of an adapter. The Wii nunchuck has 6 pins, but we only need to use four of them. Plug some jumper wires directly into the corner pins of the nunchuck. To eliminate the need to download and install a new library, I have essentially unpacked Tod Kurt's library and placed it directly into the code. However, if you still want to install it to reduce clutter you can look in step 5. 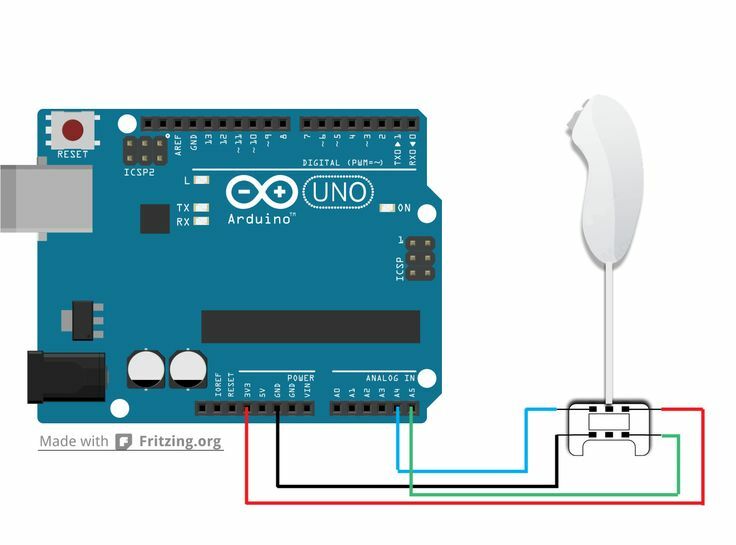 After uploading this code, try pressing the Z button on the controller to make the Arduino's onboard led blink. Wire.write((uint8_t)0x00);// sends sent a zero. Wire.send((uint8_t)0x00);// sends sent a zero. Again, open the Serial Monitor to watch what happens. Could you make a complet schema for nunchuck connector? Should be something like that?